The Wall Street protesters, people of many colors, genders and political persuasions, have been speaking out to our political leaders about the social and economic inequality between the wealthiest one percent and the rest of the population. Point B Realty appreciates all of those who supported the inaugural Teddy Bear Suite, to benefit the Martha's Vineyard Boys and Girls Club. Is it possible that ridiculous charges are being brought against an award-winning manager of the Edgartown Wastewater Plant. The 15th annual PeaceCraft benefit closed its successful month-long sale on Christmas Eve, when the raffle was drawn. I am an Islander and a Boy Scout. On December 19, 2011, I received a phone call from Comcast offering to reduce the cost of my cable service, upgrade my high-speed modem, and eliminate my Verizon home phone bill completely. It was absolutely amazing to arrive at the Aquinnah Old Town Hall and be amidst more than 100 friends and colleagues who made the occasion of my retirement a very happy evening for me and my wife, Nancy. Comcast and Chappy – Where is the good faith? The reason that Chappaquiddick residents (and Islanders elsewhere whose houses and businesses are not proximate to main roads where cable lines travel) don't have cable access is that the six-town negotiating committee that is trying to make a deal with Comcast has no leverage. What did he say? I didn’t get that. It's been fun having the kids home for the holidays. MVC chairman asks, is lawsuit worth the price? Recently, many people have talked to me about the Oak Bluffs roundabout. Back in the 1970s and 80s, when land was more affordable and it seemed there would always be buildable lots for new families, Island towns offered "youth lots" and "resident homesites" at bargain prices, allowing recipients to cash them in at full market value after as little as a decade. I am so relieved that the holidays are completely over. Zee and Bill Gamson Take on Northern California- sounds like a book title, doesn't it? Well, it was a real-life, fun-filled adventure for the dynamic couple who have returned to the East Coast after feasting and partying with the best of them. I rather agree with those columnists in leading newspapers who proclaim that nothing happened this year that changes anything in our country or our world. Has this brand-new year been kind to you already? Or better yet, what have you done to make it a better start for someone else's new year? Perhaps that could be the start of a different kind of New Year's resolution. Happy New Year, everyone! I was thrilled to be landing on a Cape Air plane last night around 4:45 to see that it was still somewhat light out. 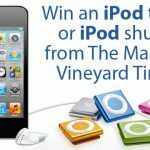 Win a new iPod touch or iPod shuffle!